Even if you know very little about web design or development, more than likely you have experienced a responsive website over the past few years. In this post, I am going to briefly explain responsive web design and why it should be important to you and your business. But before I begin, let’s go through a very brief history. Traditional websites are considered static and don’t change font sizes or reposition imagery when viewed on mobile devices. So your first question may be “why?” The answer is pretty simple – mobile devices like smartphones and tablets didn’t exist during the initial craze of website development. We were all working on desktops or laptops, so having a site adapt responsively wasn’t even an issue. But as smartphones, tablets and iPads have become increasingly popular, more and more people are viewing your site using a smaller screen. So, responsive web design was born and is now the ideal way to build a site that easily conforms to the device you are viewing it on. In a nutshell, responsive design allows your site to adapt to the size of the the screen you’re viewing it on. To see this in action, view the Chocolate Dog website on a smartphone (or resize your screen on your desktop) and you will see that the imagery changes accordingly along with font sizes. No more zooming in on a page to try and read the content – the site will automatically do it for you. Why is this important to you and your business? Statistically more people are viewing your site on a mobile device than on a desktop or laptop computer. 2015 statistics show that 51% of users are using mobile devices to view content on the web and this includes your website. So if your site is not mobile aware and responsive, you’re not reaching your entire audience. If your site is dated, take a look at your own site on a mobile device and see if you enjoy the experience. Chances are, if you’re having a difficult time reading the content, so are your customers. Need help converting your site to responsive? 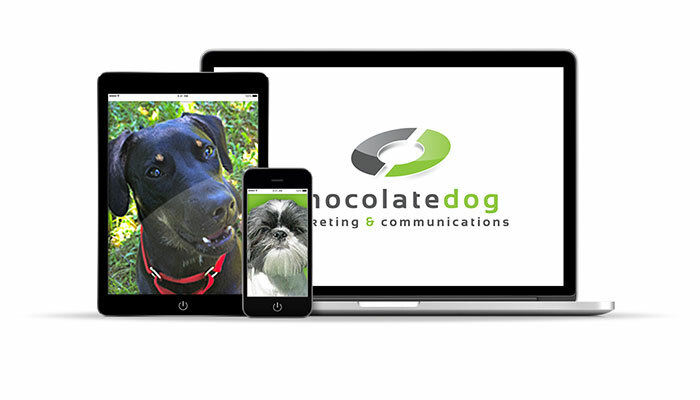 Drop us a line and Chocolate Dog will show you the way to a new, modern and responsive website.